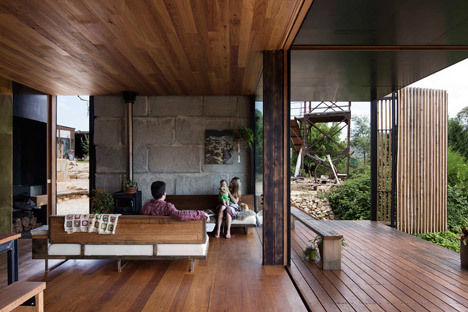 Sculptor Benjamin Gilbert worked with architecture studio Archier to build his own family house on a former gold mine and sawmill, using reclaimed concrete blocks and rough-sawn macrocarpa wood . 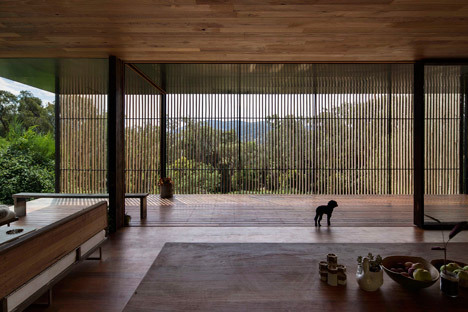 Located in Yackandandah, a small Australian town halfway between Melbourne and Canberra, the single-storey Sawmill House is an upgrade of a sculpture studio that the artist created on the site seven years previously. 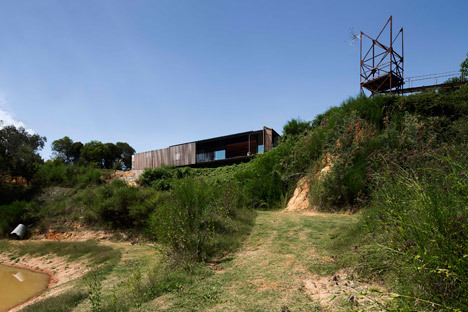 He enlisted the help of his brother Chris – one of the three founders of Melbourne-based Archier – to transform the old studio into a residence with a hand-crafted aesthetic, featuring indoor and outdoor living spaces, and views over the valley landscape. The site was originally established as a gold mine but had later been repurposed as a saw mill. 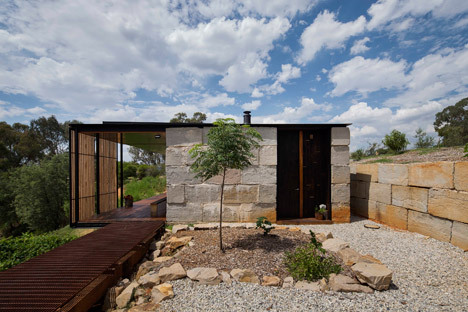 Concrete blocks were chosen as the main construction material for the house. Each weighing approximately one tonne, these blocks were a byproduct of other construction projects in the region and would otherwise have gone to waste. The team used exactly 270 blocks to construct the walls of the rectangular building. They were left exposed wherever possible, creating rough surfaces inside and out. 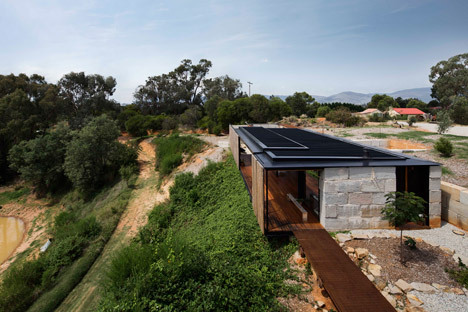 “Each of the one-tonne concrete blocks that form the perimeter of the dwelling’s walls has a story – a bridge, a footpath, a home – and create a patchwork of colour and texture across the facades,” he said. 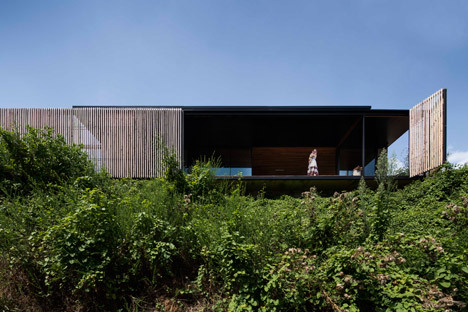 The house was originally intended as a home for Benjamin alone, but his situation later changed – so the original design has to be adapted to suit a couple with a young child. “The birth of a baby not only hurried progress, but also pushed child-friendly design changes to be made,” said Chris. 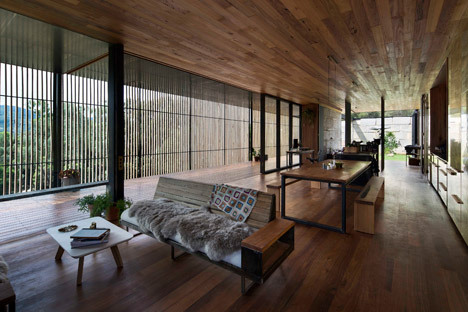 The house now comprises an open-plan space that can be subdivided if necessary to offer more privacy. 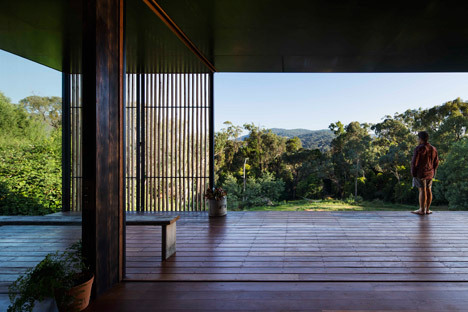 A nine-metre-wide door allows the living space to open out to a large veranda, which can be exposed or sheltered from the elements by rolling back a section of the roof. 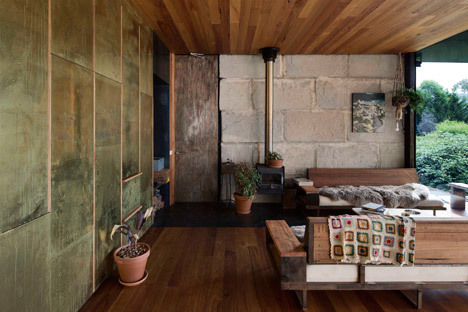 The rough-sawn macrocarpa wood was used for flooring, ceilings and joinery, referencing the old saw mill, while the kitchen was finished with sheets of patinated brass to create golden hues, in tribute to the former mine. “Timber for the project was sourced locally – we had great support from the local supplier who fell and milled the timber just up the road from the site,” said Chris. 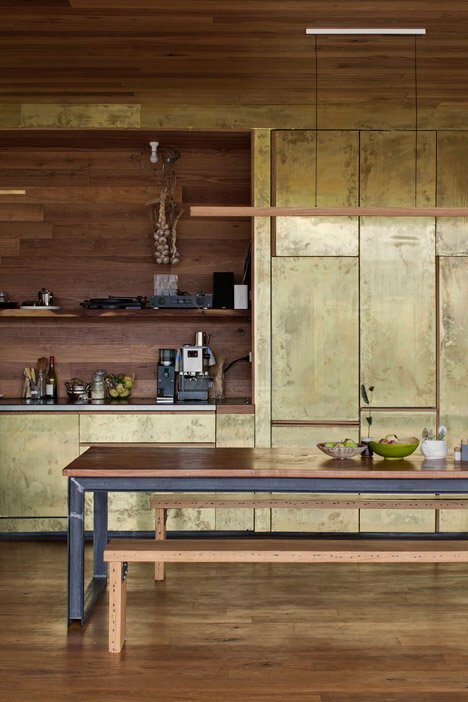 “And after some experimentation we all agreed that a thin patinated brass sheet would provide a beautiful glow and add texture to the space, while referencing the precious metals that were extracted from the site,” he added. 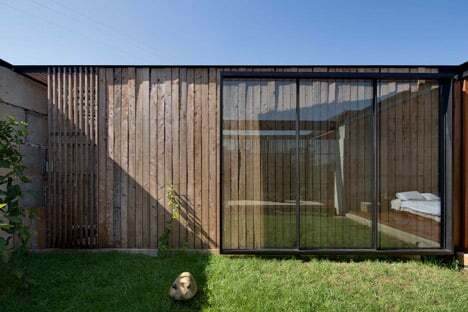 Pivoting doors reveal the master bedroom at the end of the plan, which opens out to a sheltered courtyard. 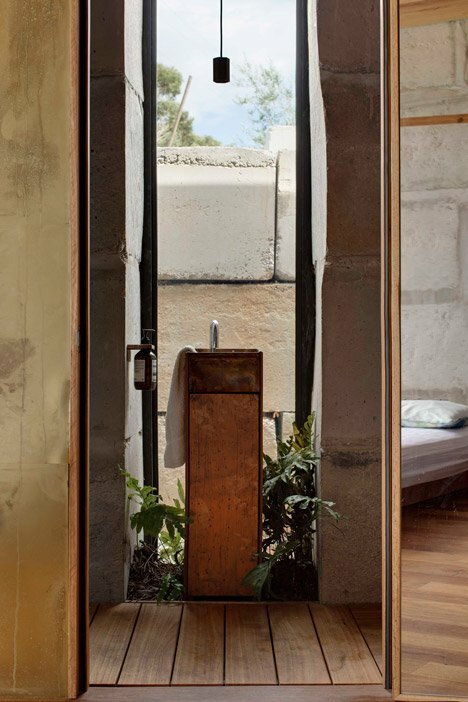 The bathroom comprises a deck that runs along the rear of the bedroom, and features a copper sink. All of the furniture for the house was custom built by the design team. This includes the wood-framed sofas in the living space, as well as the picnic-bench style dining table and lighting fixtures. “Our young family of three can now live comfortably and safely within the industrial zone,” explained Benjamin Gilbert. 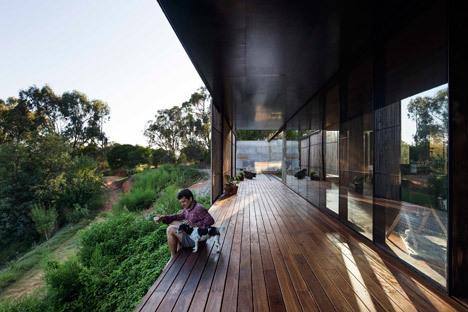 “Large operable veranda, screens and doors transform the space to suit various climatic and social conditions, which is crucial to our family who must operate in a diverse and sometimes extreme climate, and direct our home through a spectrum of private retreat to communal hub,” he added.